Images from our Farm Dinner. Ash Reynolds is the middle person in the bottom middle picture. One of the ways we support our work and mission at Youth Farm is through a variety of events and fundraisers. Over the past few years, we have developed strong partnerships with a variety of Twin Cities Restaurants and Chefs, one of the main ones being Restaurant Alma and Brasa Rotisserie. 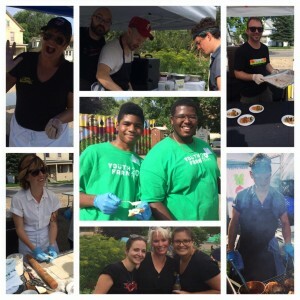 And while our good friend Chef Alex Roberts continues to be a huge supporter, his Marketing and Communications Manager, Ash Reynolds has also been the person who has brought things together, particularly at our most recent Farm Dinner in North Minneapolis/Hawthorne neighborhood. Not only did Ash bring the resources of Brasa, but she almost single handedly organized 8 other restaurants and food based groups to host a pre-event marketplace, helped us fill out our Health Department permits, and answered numerous calls throughout the planning stages to help this event run smoothly, all while making it look easy. Restaurants, Chefs, and their staff have a choice whether they want to get involved in fundraising events. We are lucky that so many wonderful restaurants continue to find ways to support Youth Farm. Ash Reynolds, as the whole Brasa/Alma team continue to be dedicated to not just show up and support our work, but help organize their colleagues. Thanks Ash for being such a great partner and supporter! Thanks @YouthFarmMN! It’s a great pleasure of ours to work alongside you and to have Ash be a part of our team. And she does it with a smile! Blessed to have her in our corner. Thanks Ash!! !